Is Muhyiddin Still “A Malay First”? That happened six years ago when Tan Sri Muhyiddin was still the Deputy Prime Minister and the, “I am a Malay first” was regarded as a heroic statement by the members of UMNO, in accordance with UMNO’s spirit of “alif, ba, ta (agama, bangsa dan tanahair)” or religion, race and nation. Below is the video of his statement originally released by MalaysiaKini’s KiniTV. But now the former Deputy Prime Minister seems to change his mind. He joined Tun Dr. Mahathir to team up with the enemies of UMNO who are against Islam, the Malay rights and the Federal Constitution such as Lim Kit Siang, Tony Pua, Teresa Kok, Tian Chua, Ambiga Sreenevasan, Maria Chin, and others. 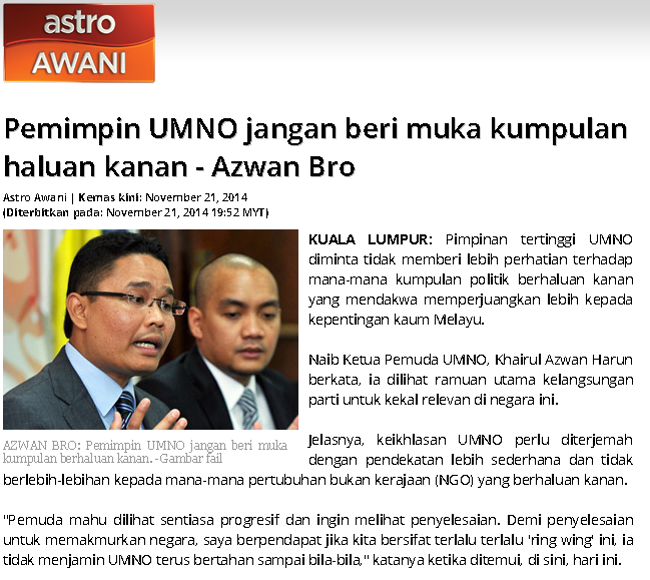 By teaming up with those enemies of UMNO, he is now against his own party and what he said six years ago. So how could he becomes teammates with Lim Kit Siang and happily sharing a couch with him? Is Lim Kit Siang more Malay and Islamic than PM Najib to the former Deputy Prime Minister? Has Tan Sri Muhyiddin forgotten that Lim Kit Siang had rudely made a malicious accusation that a verse from the Quran, the verse 120 of Surah Al-Baqarah caused religious hatred and blamed JAKIM for using the verse in a Khutbah Jumaat? By teaming up with Lim Kit Siang who is clearly against Islam and the Malay rights, Tan Sri Muhyiddin is now against his own principles of Malay first. His other new teammate, Tony Pua among others had humiliated the law and principals of Islam by making fun of the Islamic view regarding Valentines Day. In his Chinese New Year video, Tony Phua again makes fun of the Muslims by mocking a Saudi Arabian Muslim in a very humiliated ways. Another new teammate of Tan Sri Muhyiddin, Teresa Kok had ordered the Jawi script on road signs of Jalan Bukit Bintang and Jalan Taman Seputeh to be abolished. Jawi is the original script of the Malay language, and the Malay Language is the national Language according to the Article 152 of the Federal Constitution of Malaysia. Tian Chua who is another of Tan Sri Muhyiddin’s new teammate, on February 2013 made a malicious and uncalled comment about the Lahad Datu standoff saying that the death of ten policemen and soldiers from our PDRM and ATM including nine Malays who were protecting Lahad Datu was just a “sandiwara UMNO” or a theatrical staged by UMNO as a conspiracy to distract and scare the people because of the general election. Ambiga and Maria Chin are both Bersih leaders that organised illegal demonstrations against the government, creating havoc and disorder and promoting the anarchy ideology which is against the principals of the Malay and Islam. They, who are also behind COMANGO, are fighting for the LGBT rights which is against Islam apart from fighting for parts of the Islamic laws to be abolished. Sign the International Covenant on Civil & Political Rights (ICCPR) which is against the Articles 3(1) and 11(4) of the Federal Constitution of Malaysia. Sign the International Covenant on the Elimination of All Forms of Racial Discrimination (ICERD) which is against Article 153 of the Federal Constitution that gives special rights and position of the Malays and the Bumiputras (indigenous people of the Sabah and Sarawak). Sign SOGI Rights (Sexual Orientation & Gender Identity) to legalise LGBTIQ which is against Article 3(1) of the Federal Constitution and also the Malaysian law. Demands that some enactments of the Syariah Law to be abolished which is against Article 3(1) and against the second principle of the Rukun Negara that says, “Loyalty to the king and country,” because the king is the protector of Islam. What Bersih and COMANGO are fighting for are against the Federal Constitution as Islam is the religion of the Federation. Tan Sri Muhyiddin whom once claimed to be a Malay first, has now become teammates with people who are against Islam and the special rights and position of the Malays and the Bumiputras. Isn’t it weird that just because he is against the Prime Minister, his personal principals and views have changed and he is now teammates to the people who are trying to destroy his party that had once made him a Deputy Prime Minister? His actions hurt the Malays and UMNO members who had voted for him. Kalau marahkan nyamuk jangan bakar kelambu, jangan sampai menang sorak, kampung tergadai. This entry was posted in Politic and tagged Ambiga Sreenevasan, Bersih, COMANGO, DAP UMNO, Federal Constitution of Malaysia, KiniTV, Lim Kit Siang, Malaysiakini, Maria Chin, Tan Sri Muhyiddin Yassin, Teresa Kok, Tian Chua, Tony Pua, Tun Dr. Mahathir on 09/03/2016 by ahmadalikarim. It is clear that Tun Dr. Mahathir and his supporters including Tan Sri Muhyiddin Yassin, who are demanding for the Prime Minister Najib to step down, are willing to do anything to achieve their goals. In his desperate attempt, Tun Dr. Mahathir brought his troop including Tan Sri Muhyiddin who is still an UMNO man to team up with Lim Kit Siang, Ambiga and Maria Chin whose dreams are only to kill UMNO. What logical justification can Tun Dr. Mahathir gives about his latest move? Mahathir was seen at Bersih’s illegal rally claiming that they are fighting for democracy; but is it democratic to force a legally elected leader to step down just because Tun wants him to step down? This is actually an anarchy and not democracy! What is the use of having general elections if people like Tun Dr. Mahathir and friends can just force the Prime Minister of Malaysia to step down by making some declaration? As senior politicians Tun Dr. Mahathir and his troop can clearly see that what is happening in Egypt and Libya after the Arab Spring can also happen to us if they revolt against the legally elected government. Indeed, they are forcing the government to spend the country’s resources to solve problems created by them when the resources should be spent on building our nation. Please look at what is happening in Beirut, Lebanon, when the government is financially and politically weak; they cannot even solve the trash problems which has now turned into a river of trash in the middle of the city. Do they want that to happen to us in Malaysia too? It is hard to see that they actually care about what will happen to the people whom they claim that they are fighting for, but instead they are using the people for their own agendas. Anarchist politics will only destroy our country because the same action will happen again and again and there will be no strong government to lead and take care of us. This entry was posted in Politic and tagged Dato' Seri Najib Tun Abdul Razak, Tan Sri Muhyiddin Yassin, Tun Dr. Mahathir Mohamad on 06/03/2016 by ahmadalikarim. Below are some of the interesting part of Tan Sri Muhyiddin Yassin’s speech to officiate the Wanita, Pemuda and Puteri Umno assemblies. It was a very good speech that makes me respect Tan Sri Muhyiddin Yassin even more for being a brave fighter of the Malays. “Kerana itu saya telah menyatakan pendirian saya mengenai Akta Hasutan. Bagi saya, Akta ini wajar dikekalkan dengan beberapa penambahbaikan. Peruntukan khusus perlu dimasukkan untuk melarang mana-mana pihak daripada mempersoalkan jaminan perlembagaan mengenai kedudukan agama Islam sebagai Agama Persekutuan. Akta ini juga perlu menghalang mana-mana pihak daripada mempersoalkan hak penganut agama lain untuk mengamalkan kepercayaan agama masing-masing. Begitu juga dengan kedudukan tanah rezab Melayu dan Regimen Askar Melayu DiRaja yang merupakan sebahagian daripada wasiat Raja-Raja Melayu perlu dilindungi daripada perbuatan menghasut. 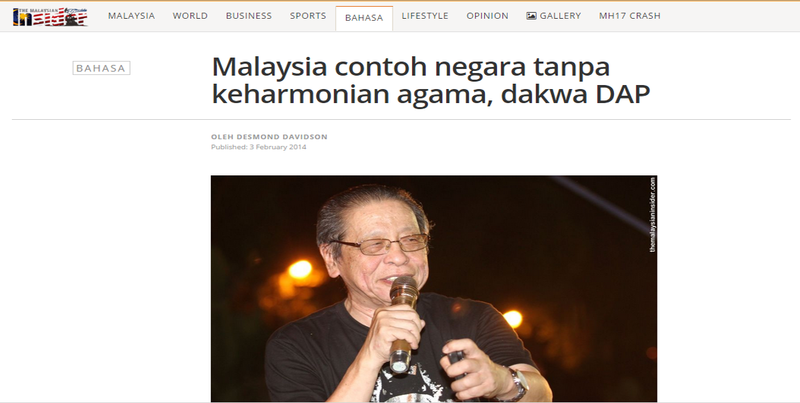 Apa yang penting ialah kita perlu melihat Akta Hasutan bukan sebagai akta yang hanya melindungi kepentingan orang Melayu, tetapi akta yang memelihara perpaduan dan keharmonian nasional.” – Tan Sri Muhyiddin Yassin. Like most Malaysian, I totally agree with him. Akta Hasutan should not be abolished. As I mentioned in my post, “Is Proham Secretary-General Questioning Rights Of The Rulers?” the Akta Hasutan is very important to maintain the stability of our country. May 13, 1969 has seen a bad racial riot and it can happen again if we are not careful. In fact, I’m not surprise if there are a small number of people who want such incident to happen. They’ll use Article 10 of the Federal Constitution to claim total freedom of speech even though they are aware that Article 10 is subjected to Clauses (2), (3) and (4), that among others restricts people from questioning the four sensitive issues. So, section 3 (1) (f) of the Akta Hasutan which protects the four sensitive issues is very important so that these issues will not be questioned even by the MPs in Parliament. “Di samping itu, institusi-institusi Islam perlu diperkasa, penguatkuasaan undang-undang Islam perlu dipertegas dan kerjasama UMNO dengan NGO-NGO Islam perlu diperkukuh.” – Tan Sri Muhyiddin Yassin. I’m truly glad to hear this statement after UMNO Youth Vice Chief, Khairul Azwan’s unbelievable statement that angered a lot of Malay activists who are the supporters of UMNO. It is really odd when the UMNO Youth Vice Chief wants UMNO’s senior leaders to turn away from the people who are also fighting for “agama, bangsa dan negara”. “Di mana taring Pemuda? Di mana ketegasan Wanita? Di mana kelantangan Puteri? Kesannya, kita seolahnya ketandusan pemimpin untuk menjuarai kepentingan orang Melayu. Sehinggakan timbul cakap-cakap di luar sana yang mengatakan NGO Melayu lebih lantang daripada UMNO dalam memperjuangkan hak dan kepentingan Melayu.” – Tan Sri Muhyiddin Yassin. There are more and more leaders who are lost and forgot which party they are in, for example, the Pemuda leaders. What did they do when people humiliate Islam and question thee four sensitive issues? On top of that, the Pemuda UMNO Youth Vice Chief wants the senior leaders of UMNO to be as liberal and forget the UMNO’s own constitution! Maybe they are too busy promoting their ‘#lifestyle’ to be cool and popular that they have ignored their responsibilities as Muslim leaders. “Penghinaan ke atas umat Islam juga dilakukan secara terbuka. Selain itu, umat Islam juga sedang berhadapan dengan ancaman ekstremisme dan militanisme yang sekiranya tidak dibendung segera akan memberi kesan buruk kepada negara.” – Tan Sri Muhyiddin Yassin. I hope serious actions will be taken to solve this problems but I wonder if all of the leaders understand this problem, especially people like the UMNO Youth Chief who are not happy with the right wings NGOs who are fighting hard against this threat. This entry was posted in News, Politic and tagged #lifestyle, Akta Hasutan, four sensitive issues, Khairul Azwan, May 13 1969, NGO-NGO Islam, Tan Sri Muhyiddin Yassin, UMNO, UMNO Youth Vice Chief on 26/11/2014 by ahmadalikarim. Apakah WOW Factor Yang Dicari Oleh TS Muhyiddin? This entry was posted in Politic, Video and tagged Tan Sri Muhyiddin Yassin, UMNO, video, WOW Factor on 20/09/2014 by ahmadalikarim. Please watch the video of Tan Sri Muhyiddin’s speech on Article 10 of the Federal Constitution : “Muhyiddin: Tiada Pihak Boleh Persoalkan Pembentukan Negara Malaysia (Video)”. The opposition parties are very busy complaining about everything that they can think of instead of working to solve the problems in Selangor, Penang and Kelantan. Now they and some human rights activists are fighting for a total freedom of speech because they want to be free to say everything they wish, including matters related to sensitive issues such as the Federal Constitution, the Royal Institution and others. Like when Lim Kit Siang humiliate the Khutbah Jumaat that reminded the Muslims of the Surah Al-Baqarah: verse 120. Hannah Yeoh went against the Sultan of Selangor’s decree on Allah issue as well as Selangor Non-Islamic Religions (Control of Propagation Among Muslims) Enactment 1988, and Article 11(4) of the Federal Constitution of Malaysia. 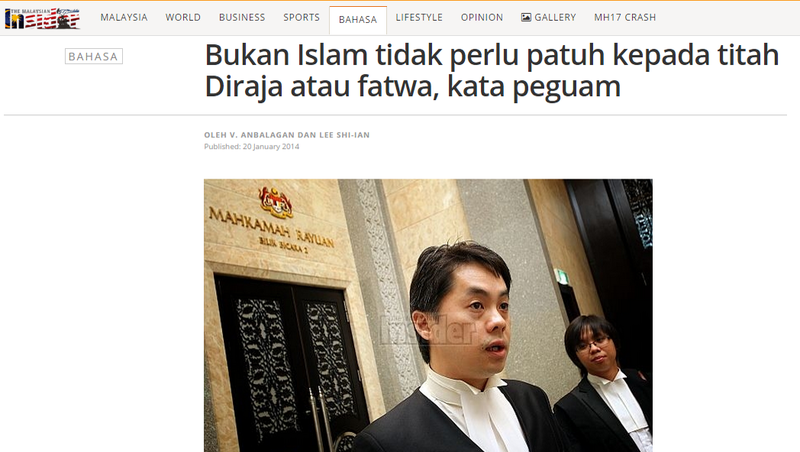 PAS’s Wan Ji made lots of rude statements against the teaching of Islam, Islamic authorities and the Royal Institution. And lots of human rights activists do not respect the Federal Constitution of Malaysia. They use Article 10 of the Federal Constitution as the reason why they are free to say anything they wish; claiming that Article 10 Clause 1 (a) granted them total freedom of speech’. Is it true that the Article 10 of the Federal Constitution gives us a total freedom of speech? That means Article 10 (1) of the Federal Constitution is subjected to Clauses (2), (3) and (4). So, the oppositions and human rights activists who support them, only use Article 10 (1) (a) and purposely ignore Article 10 (1) which says that the article is subjected to Clauses (2), (3) and (4). That means, they just skipped the part of the article that says there are restrictions to freedom of speech. That is wrong because we cannot use only a part of an article of the Federal Constitution and skip the rest of the article as we wish. They did the same when they refer to Article 11 (1) of the Federal Constitution by purposely leaving the part saying, “subject to Clause (4), to propagate it”. Anyway, freedom of speech that they are fighting for is only a total freedom for them to say what ever they want but not for others. Does Anwar respect freedom of speech if he wanted to sue the reporter who asked him a question that he is not happy with? Another example is the issue between the Chief Minister of Penang, Lim Guan Eng and PAS’s Nasruddin Hassan Tantawi. Is freedom of speech respected by people who always talk about freedom of speech in the above examples? I am tired of the opposition’s tactics to destroy the stability of our country with the help of those human rights activists who support them. They must look at themselves before telling others what to do. They are worse than ‘the pot calling the kettle black’? This entry was posted in Politic and tagged Akta Hasutan, Article 10 of the Federal Constitution, Article 11(4) of the Federal Constitution, Edmund Bon, Federal Constitution, Freedom of Speech, Hannah Yeoh, Lim Guan Eng, Lim Kit Siang, Nasruddin Hassan Tantawi, PAS, Surah Al-Baqarah, Tan Sri Muhyiddin Yassin, Tony Pua, Wan Ji on 15/09/2014 by ahmadalikarim.